This article is about the Roman Catholic Cathedral in St. John's. For the Anglican cathedral, see Cathedral of St. John the Baptist (St. John's). 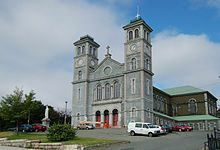 The Basilica-Cathedral of St. John the Baptist in St. John's, Newfoundland and Labrador is the metropolitan cathedral of the Roman Catholic Archdiocese of St. John's, Newfoundland and the mother church and symbol of Roman Catholicism in Newfoundland. The Basilica-Cathedral was the largest building project to its date in Newfoundland history. Construction lasted from the excavation of the ground in May 1839, through the laying of the cornerstone in May 1841, until the completion and consecration on September 9, 1855. At this time, it was the largest church building in North America and remains the second largest in Canada after Saint Joseph's Oratory in Montreal. On October 17, 2007, Bishop Martin Currie of the Grand Falls diocese was appointed archbishop of St. John's. He assumed his position on November 30, 2007. The Basilica of St. John the Baptist, as viewed from The Battery in St. John's. Built between 1839–1855, the basilica is located on the highest ridge overlooking the city of St. John's. The church is not oriented on the liturgically correct east-west axis, but faces toward the narrows that form the entrance to St. John's harbour. The Basilica-Cathedral of St. John the Baptist is built in the form of a Latin cross and in the Lombard Romanesque style of a Roman basilica. It was designed for Bishop Michael Anthony Fleming by the German architect Ole Joergen Schmidt, though Fleming also seems to have had plans prepared by the distinguished Irish architect John Philpot Jones of Clonmel, County Tipperary, Ireland, and also consulted with James Murphy, a native of Dublin, Ireland on the final plans for the cathedral. Construction was initially supervised by the Waterford contractor Michael McGrath, but later superintended by stonemason and sculptor James Purcell of Cork, Ireland, who also designed and built a small wooden church, Christchurch, for the community of Quidi Vidi near St. John's. Construction took place under the watchful eye of the Irish-born Bishop Michael Anthony Fleming, the Vicar-Apostolic and first Bishop of Newfoundland and later under the eye of his successor, Bishop John Mullock. The Basilica-Cathedral of St. John the Baptist is unusual among North America's 19th century public buildings in that it was constructed using limestone and granite imported from Galway and Dublin, Ireland, as well as 400,000 bricks from Hamburg, as well as local sandstone quarried from St. John's and Kelly's Island in Conception Bay, giving the Cathedral its characteristic grey colour. During its centenary celebration in 1955, Pope Pius XII raised the cathedral to the rank of minor Basilica. The St. John's Basilica-Cathedral was contemporary with and part of the great boom in church construction which surrounded the era of Daniel O'Connell and Catholic emancipation in Ireland and Newfoundland. For its day, the St. John's Basilica was the largest Irish cathedral anywhere outside Ireland. No other Irish building in North America can boast of such intimate influences from or upon Ireland, and no other building had such an international reputation in its day. The Basilica-Cathedral is built in the Lombard Romanesque style, based on visual features typically associated with the churches of northern Italy. The Basilica-Cathedral is built of grey limestone and white granite quarried in Galway and Dublin, Ireland and grey sandstone from St. John's and Kelly's Island, Conception Bay, Newfoundland. The exterior is 260 ft (85 m) long and 220 ft (65 m) wide; the two towers rise 150 ft (48 m) from street level. The total capacity of the Basilica is around 2,500 people, though during the visit of Pope John Paul II in September 1984, 3600 educators gathered in the Basilica-Cathedral to greet the Roman Pontiff. The Altar of Sacrifice, which stands at the front of the Sanctuary, enshrines one of the most revered and valuable pieces of statuary in the Basilica, The Dead Christ", sculpted in Carrara marble by renowned Irish sculptor John Hogan in 1854. Having seen an earlier version of this work by Hogan in Dublin, Bishop Fleming left funds and directions in his last will and testament that a "Dead Christ by Hogan" be purchased for the Cathedral. Prior to coming to Newfoundland, Fleming's successor, Bishop Mullock, also had a version of the Hogan "Dead Christ" installed in his own chapel, the South Chapel in Cork. Mullock commissioned a new rendering of the statue and placed it beneath the table of the High Altar on 19 March 1855. The statue is Hogan's greatest masterpiece and is the final of three similar statues created by Hogan in the early 19th century and the only one presently located outside Ireland. The Basilica also features works by Ireland's most eminent expatriate sculptor, John Edward Carew, whose bas-relief The Death of Nelson may be seen on the plinth at the base of Nelson's Column in Trafalgar Square, London. The Altar of St. Patrick and Altar of St. Brigid, located in the west and east ambulatorys, respectively, are constructed from the same Egyptian travertine that was used by Pope Gregory XVI, to decorate the high altar of the Basilica of St. Paul Outside the Walls in Rome. A small quantity of this stone remained in Rome and, of this, two portions were offered by the Pope to Bishop Mullock, who subsequently brought the stone to St. John's in 1856 to complete the interior of the Basilica. The East Tower contains one bell, the largest bell, the St. John Bell, currently in the possession of the Basilica. This two-ton bell was purchased by Bishop Mullock in February, 1850. Cast by James Murphy of Dublin, it was the largest ever cast in Ireland at that time, and won a Gold Medal at the Dublin Exhibition of Irish Manufacturers. There are eight bells in the West Tower. The three largest bells were cast by James Murphy in 1854 and 1857. The five smaller bells were cast in 1906 by Matthew O'Byrne of the Fountain Head Bell Foundry in Dublin, Ireland. The Basilica-Cathedral contains twenty-eight beautiful stained glass windows which adorn the upper walls (clerestory) and are of English and French workmanship. The windows were the gifts of patrons and religious societies, such as the Benevolent Irish Society and were installed between 1859 and 1905. The lower ambulatory windows all date from 1955 and were the work of the Gerald Earley Studio in Dublin; they constitute the largest collection of mid-20th Century Irish Arts and Crafts style stained glass windows in the western hemisphere. In 1955 a great pipe organ from the world-renowned Casavant Frères firm of St-Hyacinthe, Québec was installed as a memorial to the parishioners who died in World War I and World War II. The 66 stop organ with 4,050 pipes is the largest instrument in Newfoundland, and is one of the largest pipe organs east of Montreal. When completed in 1855, the Basilica-Cathedral of St. John The Baptist was the largest church building in all of North America. The Basilica-Cathedral is one of the few buildings in St. John's to survive The Great Fire of 1892. The Basilica Museum is open seasonally, and is currently located in the Basilica Residence. Exhibits include religious art, historic and religious artifacts of the Basilica, pictures of bishops and archbishops of St. John's, and furniture and decorations of several period rooms in the Residence. ^ Basilica of St. John the Baptist. Canadian Register of Historic Places. Retrieved 17 June 2012. Wikimedia Commons has media related to Basilica of St. John the Baptist, St. John's. "Basilica of St John the Baptist". The Canadian Encyclopedia.